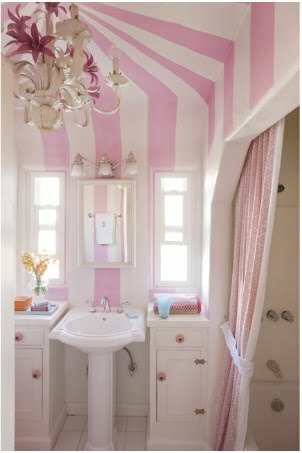 One of the things we didn't renovate when we did our own house was the master bath (now our son's bathroom). It had been redone in 1995 and while it was definitely not our taste, it was clean and fairly inoffensive. Fairly. Recently we've been fixating on this bath, partially because we saw a great photo in this month's House Beautiful (Bee Cottage - Guest Wing Renovation). We happen to have that very bamboo shelf! 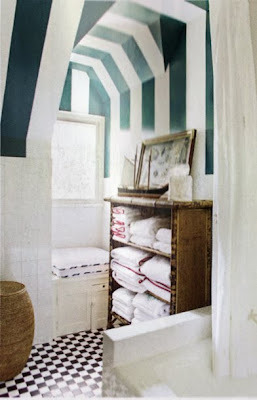 This is a bathroom by Krista Ewart, a designer who is not afraid of color. I adore her style. 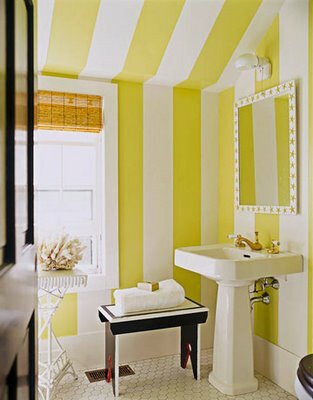 I've always loved these huge citron stripes (House Beautiful). Who could be cranky with a bathroom like this? I'm having my trusty contractor Roger come by and let me know how much it will all cost... Cross your fingers!